If you are having difficulty with your dental implants, call (714) 545-7157 and schedule an appointment with our Costa Mesa, CA dental office. It is critical that we examine your dental implant right away and that you do not try to self-diagnose the problem. This can lead to further irritation and dental challenges. During an examination, we can let you know if you need a dental implant restoration and the best way to proceed. How common are dental implant problems? They are actually very rare. At Vanek Dentistry one of the reasons that we recommend dental implants is due to their high success rate. Depending on the dentist you visit, the success rate can be as high as 99 percent. What are common dental implant problems? If there is a problem, your dental implant can become loose or the crown (tooth portion) could crack or fall off. If a problem does occur, we will be able to repair the damage and fix the situation in an efficient manner. Why do dental implants become loose? 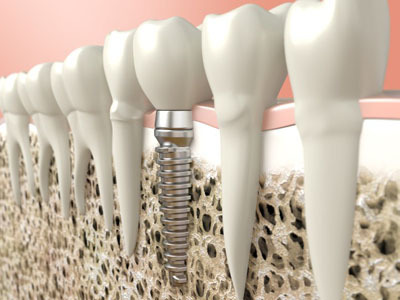 If your implant has become loose, it may be due to the fact that osseointegration never took place. Osseointegration is the process where the titanium implant fuses with the actual jawbone. The body deposits bone around the implant over the course of several months and secures the implant in the same way it secures the natural root of a tooth. If that process does not fully complete, your implant could become loose in the future. Additionally, the stability of your implant depends on your jawbone remaining dense and strong. If you develop gum disease or an infection that deteriorates your bone, the implant could become loose and fail. This makes it important to call our 92626 dental office if you notice any signs of gum disease which may include red, swollen and bleeding gums. Additionally, if you develop a toothache, visit our office for treatment right away. Doing so will prevent you from developing an infection that could negatively impact your jawbone. Check out what others are saying about our implant restoration services on Yelp: Dental Implant Restoration Costa Mesa. What do I do if my dental implant has become loose? Call us right away. The implant will not tighten on its own, nor will the problem correct itself. If you attempt to self-diagnose and treat, you can end up damaging your bone. What does dental implant repair involve? That depends on which portion of the implant we need to repair. If the actual tooth (dental crown) is cracked or damaged, we can replace it without needing to address the actual implant (titanium post). If your tooth falls out, bring it with you. Otherwise, we can examine it and let you know if we can repair the crack or chip without actually removing the crown. At Vanek Dentistry, we view this as the best-case scenario since it is the fastest way to restore your implant and the least invasive. If the crown needs replacement, the dental lab will create a new one for us to carefully attach to the abutment on your implant. If your actual implant fails, then that is a whole new process that can take up to four steps. The first step is to carefully remove it, which may require surgery. Then depending on the condition of your jawbone, a bone graft may be necessary. If your implant became loose due to a lack of density, not correcting the problem will make it impossible to replace the implant. You will need to heal from this procedure before we can place a new implant; essentially starting the procedure all over again. If you face this scenario, we can discuss the various options that are available to you in further detail. How do you treat a fractured dental implant? If the tooth portion of your implant has fractured, we will examine you and let you know if we can restore it using bonding material. If we cannot, then we will have to replace the crown. Can you replace a loose dental implant? Yes, if the actual implant becomes loose, we will typically need to remove it. We will then need to clean the area and complete a bone graft if necessary. We can place a new implant after the healing process. What will the replacement process be like? It is likely that you will need to undergo surgery so we can remove your implants, clean the area and graft the jawbone. We will complete this procedure under anesthesia so that you do not feel anything during the actual treatment. However, your recovery period may feel very similar to when we first placed the implant. There will be some swelling, discomfort and soreness. To combat this, you can use an ice pack for fifteen minutes at a time, take ibuprofen and eat cool soft foods for several days. If you also went through a bone graft, then you will need to be careful not to apply pressure to the area. In some cases, your food restrictions may last slightly longer than before. During a follow-up examination, you will be given the green light to return to your normal dietary habits. One thing to keep in mind is that if you do need a bone graft, it is likely to take six to nine months for the graft to be complete so that you can have a new implant placed. At that point, the process will be identical to when you had an implant placed for the first time. If one implant becomes loose or fails will my others do the same? Probably not. Dental implants have a success rate of 99 percent. It is incredibly rare for a dental implant to fail so if one does, your others should be fine. The only difference is that if you had an injury that caused an implant to fail, you should have all of your teeth examined to make sure that none of the rest are damaged. Do you handle all types of dental implant restorations? We can conduct an initial examination, identify what the problem is and how extensive it is. This will involve a physical examination along with X-rays so that we can determine the density of your jawbone. At that point, we will let you know if we can assist you or if you need to be referred to a Costa Mesa specialist. At Vanek Dentistry our focus is on your complete oral health and ensuring that you have access to the procedures you need. To learn more, call our 92626 dental office at 714-545-7157. © 2019 Dr. Vanek Dentistry. All Rights Reserved.